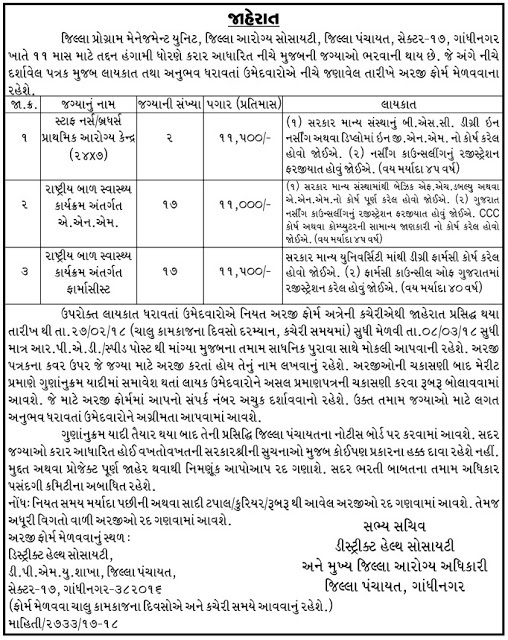 District Health Society, Gandhinagar (DHS Gandhinagar) has released DHS Gandhinagar Recruitment Notification-2018 for the post of 36 vacancies for the posts of Staff Nurse, ANM & Pharmacist. The Recruitment has complete details about their notification on its official website i.e., nrhm.gujarat.gov.in and www.careers99.com. This is a good news for those who are waiting for Gujarat Govt Jobs. Candidates may apply offline before the Last date of the Notification i.e., 08/03/2018.And the remaining details for the recruitment like Educational Qualifications, Eligibility criteria, Age limit, No of vacancies, Post names, Pay scale, Job location, Application fee, Important links, Procedure to Apply are mentioned below. DHS Gandhinagar Notification-2018 has released on its official website nrhm.gujarat.gov.in. the last date to submit the application is 08/03/2018. All the Eligible Candidates may Apply Offline before last date, and the remaining complete details for the recruitment are given below. DHS Gandhinagar Recruitment 2018 – Apply Offline for Staff Nurse, ANM & Pharmacist Posts: District Health Society, Gandhinagar (DHS Gandhinagar) has advertised a notification for the recruitment of 36 posts of Staff Nurse, ANM & Pharmacist vacancies. Eligible candidates can apply online from 19/02/2018 to 08/03/2018. Other details like age limit, educational qualification, selection process & how to apply for DHS Gandhinagar Jobs are given below. Interested candidates those want to apply for DHS Gandhinagar Staff Nurse, ANM & Pharmacist posts must having following educational qualifications. Staff Nurse / Brothers: B.Sc in Nursing from Indian Nursing Council. OR Diploma in General Nursing and Midwife from Gujarat Nursing Council. Registration is must. CCC Certificate required for additional qualification. ANM: Basic Course of FMW / ANM. Registration is must. CCC Certificate required for additional qualification. Pharmacists: Diploma Pharmacy/ Degree Pharmacy By recognized university, or an equivalent educational qualification. Must registered with Gujarat Pharmacy Council. CCC Certificate required for additional qualification. Selection of Candidates for Staff Nurse, ANM & Pharmacist posts will be done as per following stages- will be based on Interview. Eligible and Interested Aspirants are requested to Download Application Form from Below link of nrhm.gujarat.gov.in Website and Submit it to the mentioned Address before Last Date i.e., 08/03/2018.